JOHNSON CITY — It’s not uncommon to see a white-tailed deer herd or a doe with her fawns crossing from one side of the road to the other. For some kids, that’s as close as they get to Mother Nature, which is a travesty to Maggie Goodman, librarian at the Johnson City Library. Goodman is taking action with “Backyard Wilderness,” the library’s latest exhibit. It opens for a two-month-long stay at 10 a.m. Monday, July 9, at the Johnson City Library, 501 Nugent Ave.
“Backyard Wilderness” is a 60-square-foot, pop-up exhibit that features photorealistic artwork, a scavenger hunt of 15 different plants and animals hidden in the exhibit, “telescopes” that provide information about the creatures at which they’re pointed, and tips on how to become an outdoor explorer. A companion pop-up banner with a scavenger hunt cheat sheet outlines other ways to engage in learning about nature. Two other features are a bioblitz at 8 a.m. Aug. 24, which will be located on a 5-acre tract at Lyndon B. Johnson National Historical Park, 100 Ladybird Lane, and a 3D “Bioblitz” film. A bioblitz is a biological survey of a designated area. Groups of scientists, naturalists, and volunteers conduct an intensive field study over a continuous time period. This Central Texas bioblitz begins early for a reason. “It’s going to be cooler, and you’re more likely to see animals in the cool of morning,” Goodman said. Tech-savvy kids will enjoy participating in the bioblitz with “Seek,” a new kid-friendly app designed by the California Academy of Sciences, the group responsible for the iNaturalist citizen science app. “Seek” is more like a scavenger hunt that allows people to earn badges as they photograph new species and learn cool facts about critters and plants, becoming more engaged with wildlife around them. “Seek” has lists of commonly photographed insects, birds, plants, and amphibians in the Highland Lakes. The 5-acre diameter includes a pond, native grass, and cypress, pecan, and oak trees. “One reason we chose this native area was being able to find more species and getting out and enjoying nature,” Goodman said. 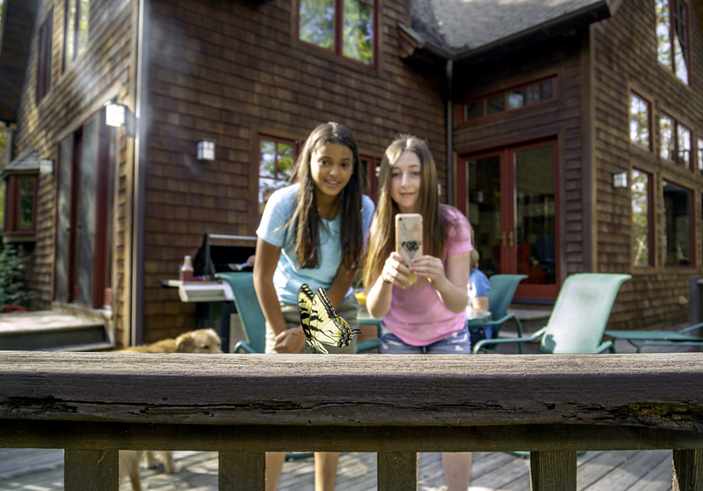 “Backyard Wilderness” the movie focuses on Katie, a young girl and her family who spend more time on their electronic devices than in nature. Katie gradually discovers the wonders of the outdoors at her home and moviegoers can see her joy as she uncovers this part of her world. Goodman is still hunting for a place to show the 3D movie, but it will be shown somewhere, she said. Check with the library at (830) 868-4469 for more information. People can participate in activities in conjunction with the exhibit, the librarian said, including taking a family activity guide that encourages children to directly engage in nature through investigation and observation. They can do that by watching insects on observation-based nature walks. A grant from STAR_Net, which arms libraries with resources specifically for science-technology activities, helped the library obtain “Backyard Wilderness.” The exhibit is the latest in a series of traveling exhibits the library wants to host. She is especially looking forward to this exhibit because of its reverence for nature. “What we’re promoting through the film and education (is that it) matters to get families and youth out into nature, and not just out but to learn and appreciate nature,” she said. “Backyard Wilderness” ends Aug. 24, so don’t wait too long to get your kids over there to learn more about the natural world around them. Call the library at (830) 868-4469 for more information.